Captain Jackson: I just returned home from a three day trip fishing on Lake Jackson with my dad, my son, and my nephews. Jamie, Glen, Dumas, and Russ were all fantastic. They were all very knowledgeable, experienced, courteous, and very professional and their primary objective from the start was to put us on fish and provide us with a positive experience for our trip. The fishing was phenomenal! I’ve never experienced anything like it! The five of us boated 250-300 bass in three days fishing 4-5 hours each day and the day I spent in Jamie’s boat with my dad and my son was a once in a lifetime experience! We caught 80-90 bass with 20-30 in the 3-6 lb range and topped it off with my 13 lb 8 oz monster and then 30 minutes later my dad’s 12 lb 6 oz lunker! UNBELIEVABLE !!! I still have to pinch myself to make sure I’m not dreaming! I will most definitely be giving Jamie a call again the next time I can make it to central Florida. I wanted to thank you again for helping us out in the huge pinch we were in with getting dumped by another guide service. I felt providing a testimonial was the best thing I could do. 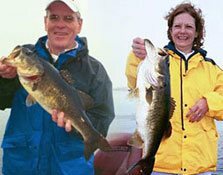 "I am a novice to intermediate bass fisherman and my wife fishes occasionally with me. We agreed during our honeymoon we would hire a guide and go out and catch some Florida Largemouth. I paid a guide the deposit, had $40 sunk into my fishing license only to have this guide cancel on me less than 12 hours before our trip! In a panic, I called AJ's guide service. He took care of us and got us a guide for the next day with practically no notice. 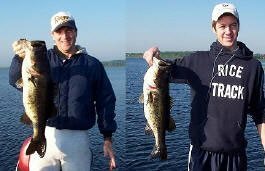 Captain Jackson: My husband and sons fished with you a couple of weeks ago, Kevin's fish was approximately 9 lbs and Lance caught 2 big ones that you estimated at 8 lbs, and 7.5 lbs. All they can talk about since we've been home.is the fishing trip!!! -- They don't even mention Disney World!!! We want to thank you for such a great experience! Poe Family of Jemison, Alabama. "Toho is not what is used be!" "There are no more big fish!" "A good day is catching 5lb fish!" These are the comments made by a fishing guide that I used this past March 2009. I thought what a shame. My daughter and I had fished this lake once before 10 years earlier and caught 10 fish ranging from 5lbs-8 ¾ lbs. The guide said I won’t see a day like that again. He said sure there is a guide that will tell you that you can catch the big ones but he exaggerates and lies. "Makes bad for business." Well the guide was right he could only get us on some small fish, nothing over 5lbs. Such a disappointment since I can catch those fish back home. WRONG! WRONG! WRONG! I have to tell you the guide I went with in March could not have been more wrong. I almost feel like calling him and asking for a refund. Let me tell you about AJ Freelancer Guide service. My family made a second trip to Orlando this time in Dec 2009. My wife asked if I was going to go fishing and I really didn’t want to spend the money on 2lb fish. 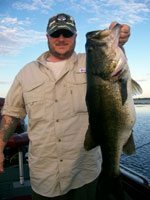 I started looking at guides in the area just for the heck of it and came across website with a huge notice: NEWS FLASH FROM THE CAPTAIN: I have found a concentration of 8-12lb bass. Well if you are like me you are thinking from a skeptic mind. This guy is false advertising and full of well you know what. So I called him and spoke on the phone with him and decided what the heck, it gets me away from Disney for a day and out on the water. We head to the spot and he tells me that he doesn’t troll and that I should plan on sitting in this one spot. At first I am like oh great another bad trip. At least the last guy had us move around and even trolled for the bass. (I hate trolling but was willing to try anything to get some fish last trip). I would say that with in 15min I landed my first fish it measured 27” long and 16” in girth. I am thinking that is a nice fish and Captain says its about 9lbs. WOW that is great! By the way if you do the calculations online the fished possibly weighed 9.72lbs-11.4lbs…depending which formula you use. The 2nd fish was Bigger, 27” long x 17.4” girth. Captain said about 10lbs. Again the calculations estimate it to be 10.5lbs – 12.4lbs. All I can think is that other guide was so far off from the truth. By the end of the 5 hours I caught total 17 bass….the 4 largest 7, 8, 9, 10lbs. 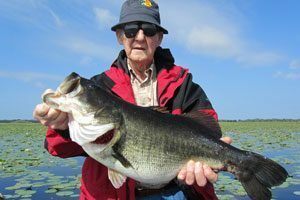 If you want to catch the bass that made Lake Toho famous then I would recommend a guide who has 30 years experience catching Huge Toho bass, AJ Freelancer guide service. I think the pictures speak for themselves. Thanks for a great fishing charter, I hope others start to realize the guide can make a huge difference. "Dear Captain Jackson. We want to thank you for the awesome guidance you provided on our recent visit to West Lake Toho. The 13 largemouth bass we caught with you, including the 12 ½ pounder and several in the 7 pound range, were the biggest freshwater fish we have ever seen—let alone caught. To think that we caught more than 50 pounds of fish in less than 4 hours is incredible. You followed through on all your promises, and set us “in the fish” for the four days we were in the area. And for that we are grateful. Without your generous advice and guidance, we couldn’t have hoped to approach the success we achieved. We have already given your contact information to one of our fellow resort friends, and will highly recommend you to anyone who asks where we caught our monsters. Best of luck. See you next time. 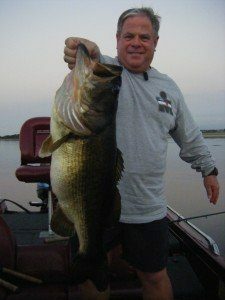 Sincerely, Gary Daley, Ray Keller, Ken Argenti -The Jersey Boyz"
I've been Bass fishing a good 500 or more days in my lifetime and it was my youngest daughter Sydney, fishing with you who caught the BIGGEST BASS EVER! The trip you took the girls on was created memories that will last a lifetime. Your knowledge of the lake, the fish and your surroundings is amazing. Given the fact that there was a front hanging in the area coupled with fog for the entire morning we fished with you, I find it exceptional that the girls were able to catch such fish. According to the measurements it appears Sydney's bass was apx 9.25 Lbs. and Katie's male was as you mentioned around 3.5 Lbs. Couple that with a total catch of 10 or more Bass for a morning catch and all I can say is YOU and your Guide Service are EVERYTHING ANYONE can ask for. You and I both know there are many people out there who say they can, they know, and they can do, when the truth is, there are not that many who really know and really can. You Captain REALLY KNOW and REALLY CAN produce results, even in less than optimal conditions. That SIR is the test of a REAL PROFESSIONAL of which I find you to be. Again I want to THANK YOU for personally taking my girls and teaching them what you did about the area and wildlife they were exposed to. I am enclosing a few pictures I took while with you for your review. "Captain Jackson, We had a blast on the water today and I can't even begin to explain the rush of emotion going through me after catching a 10 pound bass. It has been my lifelong dream to accomplish such a feat and I am so glad you were our guide for that trip! I know that this is not the best season for catching trophy bass -- so catching a big one anyhow just made it that much sweeter! 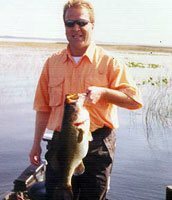 I will be back to fish with you again and will definitely recommend you and your service to anyone who wishes to pursue giant Florida bass. Thank you. Toby G."
"My wife and I just returned from a week's vacation in Florida, taking a break from Pittsburgh's cold winter. Luckily, the February edition of In-Fisherman arrived prior to leaving. 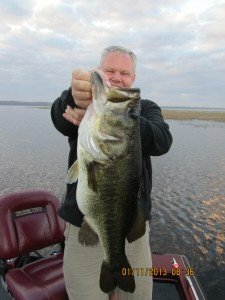 I was excited about the article (Nature's Way) on bass fishing Lake Toho (Tohopekaliga) with wild shiners! I was even more impressed with Captain James Jackson incredible knowledge of fishing for largemouth's this way... ...great day, pulling them in one after the other. And we can't say enough about Captain Jackson! A great guide and really nice guy. He made our fishing day a real life experience, and we'll be going back. 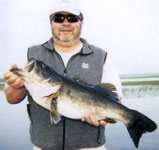 I would recommend him to anyone who wants to learn about bass fishing first hand." Just a quick update and thank you! Your pairing us with Capt. Russ was a great pick. He really took very great care of us and made Toho memorable for Christine, who improved her personal best bass from a 5-06 to an 8-04. We had some great fishing, in all two 8's a 6, and four 5's with 90 some Bass (and the daily by catch of the dirty dozen of assorted Gar, Bowfin, and Pickrel) Cpt Russ made the most of each day and his patience was noteworthy with getting us to an acceptable level of proficiency with the shiner technique to an acceptable hook up ratio that we felt we were accomplishing something beyond feeding the fish, lol. In sum, a super guide that reflects great credit on you and your service. "Just a note to let you know Jamie (my son) and myself really enjoyed our day fishing with you! You sure are a knowledgeable fisherman and a real pleasure to spend time with..."
"...It was the best fishing charter I have ever been on. It will be something Brandon and I will remember for a long time. If we are in the Orlando area again, we will definitely contact you." "My husband, Ben, and I had such a wonderful time on our fishing trip on Sunday, May 2nd with Ralph Anderson, our guide. He was the best!!! In fact, I have never had as much fun as I did bringing in those large mouth bass. I will always cherish the memories that we made that day. Thank you, thank you, thank you." "Thanks for a great time.....Captain Brent was a very personable guide and we especially enjoyed his new Fast Cat!" "I just wanted to drop you a line to let you know how absolutely fantastic the whole experience was. I have been bass fishing for years, but never had the opportunity to fish in Florida. Glenn was the consummate professional and really made me feel as if he was there for me. Other guides that I have been with just have not done that..."
"I just had to email you and let you know what a great time we had fishing this week and we have y'all to thank for it. 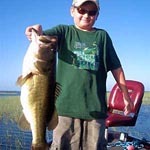 When my son Jordan and I talked about going to Florida to hunt for BIG bass, we had "hopes" of catching at least 1 bass over 6 pounds. The holy grail of lunkers in my mind has always been the elusive 10 pounder. I've fantasized about catching a bass like that but have come to accept that it would probably never happen. Up to this point the largest bass I've ever caught was a 6 pounder. Well, thanks to Ralph (one our your excellent guides) my dreams came true this week. I hooked and landed a beautiful 10 pound 1 ounce lunker. As if this wasn't enough, my son landed a beautiful 8 pound 4 ounce lunker within 15 minutes of my 10 pounder! This happened very early on the first day of our trip so we were immediately satisfied with lake Toho and especially your guide service; however our fishing was far from over. We fished another 3 and a half days and calculated that we caught a total of 106 pounds of largemouth bass!!! We WILL be back next year and we WILL be enlisting your guide services once again. Thanks a million for helping to make my dreams come true. Also, I have a great digital photo of our two biggest bass. I'm attaching the photo to this email so you might post them on your web site. When should I expect to be able to see the photo on your web site? I'm anxious to show them off to all my fishing buddies." 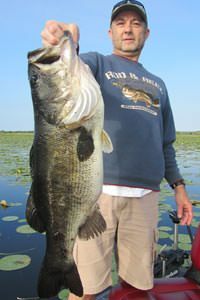 "My wife and I were on vacation down in Orlando from Minnesota and I had always dreamed of catching one of those huge bass that you have in the southern states. Well, you made that possible, I caught a 10 pounder and she caught a 6.5 pounder! THAT WAS THE BEST EXPERIENCE I HAVE EVER HAD!!!!! Not only that, but I was shocked to see my picture on your web site, it’s the second from the last with me holding 2 fish, I’m wearing a black tank top. Thanks a million." "Just a note to say thanks for setting up a guided fishing trip for me and my 6 year old grandson on short notice last week. You were correct- it was the fishing trip of our lives. We caught 11 bass and 1 pickerel on the 6-hour trip. Thanks Much from Tre and me. Tre talked about the fishing trip all the way home, and he obviously enjoyed it more than Busch Gardens, baseball, the beach, etc." "Wanted to drop you a line and thank you for the trip we had on the 27th. Even though the weather caused the action to be a little off, boating 8 bass and missing 5 more (while everyone else – those on the other boats -- had only 1, 2, or none) proved you got the SPOTS! My friend Paul and I are already trying to set up another trip back – this time to get the Big Girls…Remember – keep those shiners CONCERNED!!!!! And, Nan, if you do set up a (comments) page, feel free to use the quotes. Jamie already joked that he would use my saying ‘concerned’ instead of ‘nervous’ when on the water – I told him to give me writing credit!... Thanks." "I’ve seen the article in IN-FISHERMAN MAGAZINE with your picture. I think it is great that you are getting such recognition. I was down in June with my nephew. He caught an 8 LB bass. We had a great time. We are planning another trip in March." We can't thank you enough for the wonderful time we had on our Bass Fishing charter! Glen was just awesome and he was so helpful. Even though my wife caught more fish then me, with Captain Glen's help I was able to land the biggest Bass I ever caught. I'm attaching a picture of my personal best, a 9 lb. 6 oz. largemouth. What a thrill that was! We will be back in the fall and will recommend your service to all our friends. Thanks again for everything!" "James, Just wanted you to know that Brent did a great job as a guide on Saturday!! We caught about 10 bass 6 of which were 6lbs or so. I had the thrill to my life. I'll be back next year." I just wanted to send you a quick THANK YOU my day on the water with Glenn was by far the Best Fishing Day I have ever had. My best fish was 9lb 2oz @ 25 inches. Glenn is a very good fisherman and his knowledge of the lake made my day a very memorable experience, I have fished with several other guides in my life but Glenn is definitely the BEST one that I have had... ...Thanx again for the memories." "… the trip my friend and I made last year with you was very enjoyable, not solely because of the fishing but because of your actions as a guide. You made us feel welcome and comfortable and were so willing to share information, even when you knew we only live 75 miles away from Toho. On our trip for February 14 and 15, I will have a different buddy with me. He is from Little Rock, Arkansas. I look forward to fishing with you again…"
"Just thought I’d send you a couple of pictures of the results of some trips I made after being guided by you. These fish are a direct result of your generosity of information about the lake and where and how to fish. I’m looking forward to our visit in December. I appreciate the kind way you have extended you friendship. May God bless you and your family." "Thanks for the great time that my mom, dad and I were able to have fishing with you. We had a blast. How has it been since July 3? Hope you haven’t broken the 10 fish roll that you were on. I really appreciate the way that you explained to us exactly how the different weather and moon phases affect the fish biting. I had read about some of the factors but never had it explained so easily. I wish that I had spent the time I spent at Disney and Universal Studios on the Lake (Toho) instead. Thanks again for keeping me posted on how things are going. I really hope to come back around Feb. 2002. 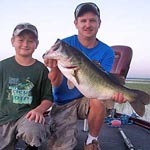 It will be very easy to talk my fishing buddies and Dad into a trip." "Thanks for the trip; it was a blast! I expect to return to see you next January..."
"In addition to the fish in the photo, we caught at least 5 bass over 8 lbs. and a couple more between 5. and 8. Quite a morning! Looking forward to a fine day of fishing again with you."